Jim's Blog: Even the ruskies lost interest! i like to look at the stats from the blog - just interested to see if there have been any views or comments. so far, nary a comment - which is fine. but seeing where the views do come from is always interesting to me. growing up i used to listen to shortwave radio - and would send a postcard to the different radio station i would hear and then they in return, would send a QSL card back. had a big collection of them. even had radio Havana sending me things up till i was sr. in high school. anyway, heres the latest stats from viewers like you! 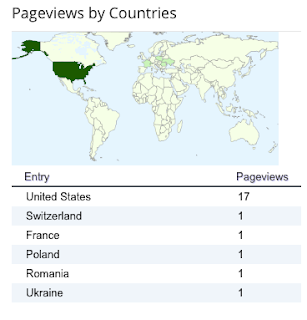 as you can see from this, my viewership is down in the mother land. must not be too interesting to them or maybe i don't translate well!